If you are inquiring about window installations, you come to a point in your home ownership that has caused you to want a new look or you are facing some problems with your windows. You might be in need of an updated window to open up your home. Or maybe you are experiencing some increase in energy expenses, decreased safety, or poor fits or rotting frames. If any of these fir the situation, you are at the right place! 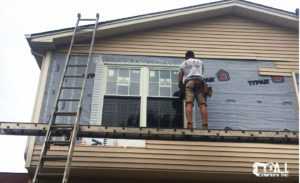 AJ Exteriors has tremendous success and experience with double hung window installations. Hence, each of our clients are left with a beautiful view and increased functionality. When you are considering double hung windows installations, you will find that the initial cost of installing this style of window is higher than a single-hung window. The reason for the extra cost is that the windows themselves have a capability to open both top and bottom panels or frames of the window. After the installation is complete, there is no cost difference in maintenance costs. Not to mention, it is much easier to clean since both windows can be tilted to wash the inside and outside panels. There will no longer be a reason to step outside of the home! This makes gives you an advantage when you are cleaning the windows of a multilevel home. You won’t need special equipment or professional cleaning crews to help you clean the outside of your second floor windows. When choosing double hung windows, the ventilation greatly increases because you can open both top and bottom panels. Style are available in a variety of options to give your home curb appeal that you are looking for. AJ Exteriors double hung windows installations will allow you bring security and safety to your home. Double hung windows will also bring energy efficient ways to save time and money. Call us with double window restoration concerns. We are glad to walk you through your restoration and replacement options.